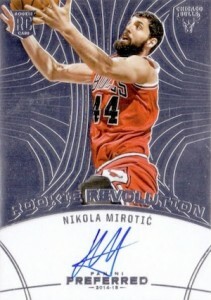 One of the top rookies in the 2014-15 rookie class and one of the only rookie players on a legitimately good team, Nikola Mirotic has still made managed to carve out enough minutes and productivity to catch the attention of collectors. 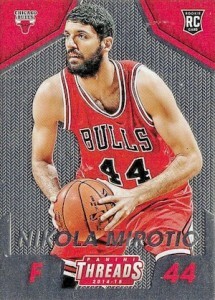 While his cardboard options are noticeably less than many of the other NBA rookies, the few Nikola Mirotic rookie cards that are available are seeing strong interest. 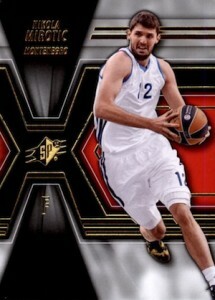 Shop for Nikola Mirotic cards on eBay. Nikola Mirotic was born in Montenegro and also holds Spainish citizenship, which allows him to play for the Spanish National Team. His pro career began in 2008 with Real Madrid and he was later drafted in the first round of the 2011 NBA Draft by the Houston Rockets. His rights were soon traded to the Minnesota Timberwolves and finally the Chicago Bulls. 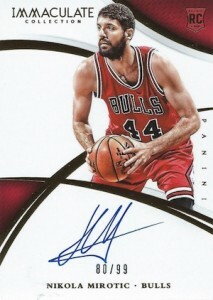 Mirotic remained in Spain for a few more years and finally joined the Bulls for the 2014-15 season. Given that Nikola Mirotic plays the same position as Pau Gasol, he is mainly used off the bench and in the fourth quarter. Despite inconsistent minutes, Mirotic has produced stretches of impressive play. This includes his performances during the month of March where he averaged nearly 21 points and eight rebounds per game. He was also named the Rookie of the Month in the Eastern Conference for December and March. He was later named to the 2014-15 All-Rookie First Team and finished second to Andrew Wiggins in the Rookie of the Year voting. Collectors will notice that Nikola Mirotic is absent in many of the early-season releases and very limited in subsequent products. However, now that he his play has taken off, expect more products to include him and he will be in most of the high-end options. 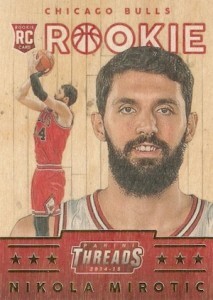 View a full look at the official rookie cards for Nikola Mirotic and his notable pre-rookie and college cards below. 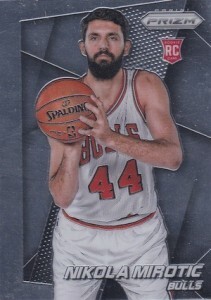 Basic and inexpensive, this is the sole simple rookie card for the lanky power forward as Nikola Mirotic was not included in Hoops. 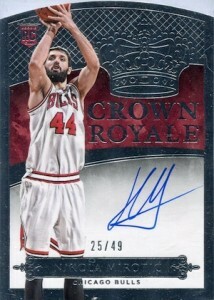 In addition to a variety of Press Proofs parallels, there is also a signed Elite insert for Mirotic. 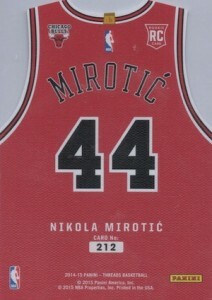 While the lack of jersey a jersey piece makes it stand out from the other Immaculate Collection rookie cards, the high-end option for Nikola Mitotic still features a quality look. Compared to the standard version, it actually looks better overall without the patch wedged into the center of the design. 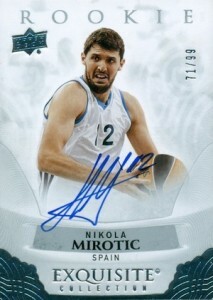 Given his overall limited card options, 2014-15 Preferred is likely very appealing to Nikola Mitotic collectors. The hit-centered product features four signed cards for Mitotic in the base set. While the variety is nice and none are too common or especially rare, the fact that he does not have a Silhouettes card is somewhat disappointing. 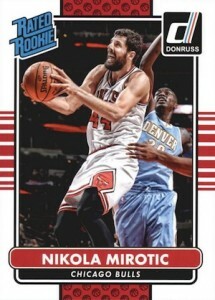 A staple of the Panini basketball lineup, the base Prizm card and many parallels for Nikola Mirotic offer collectors a great place to chase the rainbow and a solid budget rookie card. 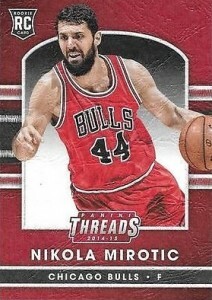 The Target-exclusive 2014-15 Threads includes four different rookie options for Nikola Mirotic in the main base set. Not just limited to different images, each card includes a different cardboard technology as well. All four versions can be seen below. Very similar to Prizm in both the overall look and the parallel options, the Totally Certified rookie for Nikola Mirotic also includes the same image. While not technically a rookie card, the dynamic design and low print run of the Panini Private Signings autograph makes it a compelling option. 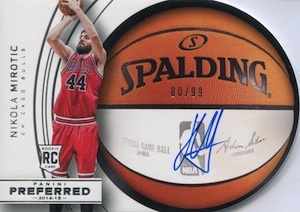 Part of the NBA Finals promo set, the sticker autograph card offers a alternative to his more common signature cards. 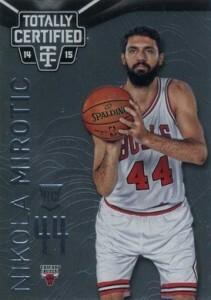 One of the earliest cards for Nikola Mirotic also remains one of his most valuable. Part of the late-season 2013-14 Exquisite Collection release, the Mirotic insert features an on-card signature and print run of 99. There is also a Spectrum parallel, numbered to just 25. 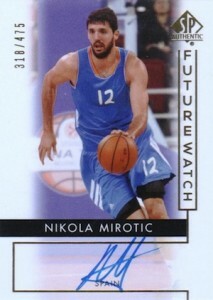 Offering another plentiful Nikola Mirotic card in the main set, the SP Authentic Future Watch subset is a great place for a budget on-card autograph card for Mirotic. 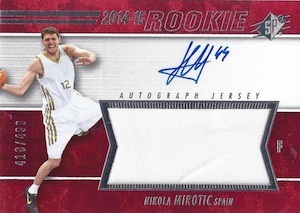 Showcasing added quality and a more limited run, the Limited Rookie Auto Patch for Nikola Mirotic includes a small patch and on-card autograph. 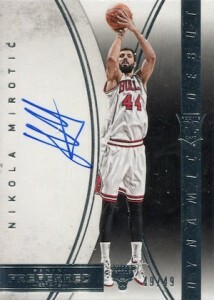 Although Nikola Mirotic has a true base card in the main 2014-15 SPx set, collectors are more interested in the autographed jersey card. The air-brushed uniform is a little more noticeable, but the larger print run makes it one of the easier autographs to track down. Also, while the sticker autograph is not ideal, the design does a good job of incorporating the sticker so that it is hardly noticeable. 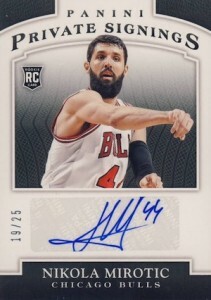 Another instance of reusing images, the main Nikola Mirotic card option in 2014-15 UD Letterman is numbered to 999 and there are also signed parallels with a sticker autograph.